DriveArchive - Articles - Swap me a Peugeot 205 for a 206? My Peugeot 206 is now about two and a half years old. I traded in a nail of a 205 diesel for it. I really miss that 205. 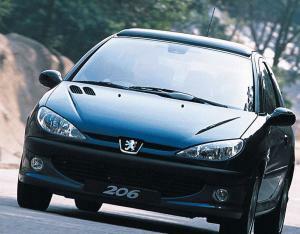 The 206 looks very nice. It's a pleasant light metallic green, and the shape is pleasing to the eye. It has been almost 100% reliable, which I admit the 205 was not. But I still want the 205 back. Unfortunately a local woman has it now, so I get to see it trundling around almost daily, and therefore daily I get this pang in my stomach, and a hollowness in my wallet. What's wrong with the 206 then? Well. It's noisy. The engine (first mistake, bought the 1.1, should have got the 1.4, they say) is harsh and lacks any sort of go. The 205 was a great big 1900cc diesel and could really pull up hills, and returned 60+ m.p.g. The petrol 206 struggles up hills and returns a disappointing 50 m.p.g. Hmmm. The gearbox is very noisy in first, a loud whine... "yes they all do that" the dealer tells me. Do they now? Second big mistake, chose the sunroof version, not the air con. My beloved 205 had one of those huge sliding glass sunroofs, and so I went for the same option on the 206. An error, as it makes a huge racket when it's open and a lot of rattling when it's shut - "yes they all do that" the dealer sighed. His mechanics have applied the Peugeot fix to this problem, which entailed stuffing bits of sticky backed stuff in various places which cured it for a month and then they all fell off. When open there's a clever sort of air deflector thingy which pops up. I swear it's this that causes the excessive wind noise. It renders conversation and radio listening impossible, so you shut the thing again fairly quickly. The driver and passenger seats are rubbish. They've both been partially replaced under warranty, but they're still not much good. Bits fell off, things that should slide didn't, bits that should stay stiff flopped about. And they aren't very comfortable. There is a useful storage area under the passenger seat which sounds just dandy when they tell you about it in the showroom, but never gets used in real life, because of child seats, passengers and general detritus that gets put on the passenger seat. To tip it all of to get to the nice cubby hole, well it just never happens. On the plus side it doesn't seem to leak, which the 205 did. There was a small water feature in the back footwell most rainy mornings in my 205 days. I admit that I don't miss the sloshing noise going around corners. The 206 is ultimately faster on a motorway, and is a lot perkier around town than the diesel, but show it a hill and it starts demanding downward shifts, which gets on my nerves. The 206 has a jolly nice CD player, which is a huge improvement on the cassette eating monster in the 205. And the stalk controls for volume and so on are great. Oh and the electric windows and door mirrors are a huge improvement on the cranking and fiddling of the 205. The old diesel had done over 120,000 miles when I sold it, I wonder if the 206 will see that distance. Though it is jolly nice not to have it serviced for two years at a time, I really do worry about the oil. I know it's very clever and all that, but does it really still protect the engine towards the end of that sort of time period? Have they tried it? Do they really know for sure? I know deep down the 206 is a very nice car and I should be happy with it. And even deeper down I know that the 205 was on its last legs and its shortcomings were started to add up. But that doesn't stop me looking at it with regret. I'm sure I was happier with that old thing than I am now with my fashion statement.